Better Day Today - Whew! The pains yesterday didn't make any repeat performances today and the doctor thinks it was muscular pains from the symptoms I told him about. Blood work went well and I got my Herceptin and Taxol lunch special and made it home by 3:30 this afternoon. I am so glad that I feel so much better today. I was a good girl and I wore my white surgical mask there and back. The jr. high school students are home early from school this week as there are no extra-curricular activities like band practice or track and field so the kids can study a little before their final exams. It is M's first experience with "tests that count." and she's been diligently looking through her textbooks and notes. The elementary school should have started swimming lessons during gym class but they have a policy of no swimming in the rain or if the combined air and water temperatures are less than 50 degrees C (122 degrees F). What a waste of the school pool! What's wrong with purple lips? They've been begging me to take them to a pool every weekend but I think I'll pass on that and try to enjoy activities a little closer to home with fewer people around. Until this morning, I've managed well enough with annoying discomforts that can be endured for the purpose of shrinking the ugly cancer in my lungs. This morning I managed to get up, feed the kids, make some lunches for the two who had no school lunch today and send everybody off to their respective schools. A half an hour later I started to get an ache in my chest which I felt could be from coughing all week. I noticed one of the girls had forgotten to take her packed lunch so I set off on the bicycle to deliver it to her school. By the time I got to the school I was wondering if I was having a heart attack the pains became so severe and spread all over my left side and around to my back (but not the arm). I didn't feel up to climbing to the fourth floor to find out which daughter forgot her lunch and lucked out when a teacher headed that way offered to take it to the teachers' room to have the homeroom teacher deliver it for me. A quick guess at which daughter might be lunchless and some thank yous later, I was wobbling back home on my bike, the pain increasing. I decided to lie down for a while to see if the pain would subside and it did, after a little less than an hour. I slept all day and went off to teach my Monday afternoon classes and will definitely ask my oncologist about this at tomorrow's visit. This is the first "pain" and not just discomfort I've had in this cancer experience and because I've always thought that I had a fairly high threshold for pain, it worried me that I had any pain at all. 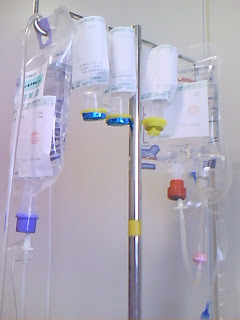 There could be a number of reasons for it from listed Taxol side effects (I'd have thought that this type of pain would be closer to the time of infusion and not 6 days later though) to panic attacks, tired muscles from coughing all week, pleurisy, viruses or heart attacks. It'll probably be something like a bra that was fastened too tightly (Where did I put that bra extender?). Seems like I'll never run out of things to talk about with my oncologist. I'm glad things have calmed down at any rate, whew! The good news, I got the right daughter and she was grateful for the delivery. Feeling incredibly light headed after deciding when and where to leave the majority of my locks. I've heard varying stories regarding hair loss on Taxol either thinning or complete loss of hair and decided to start out with a very short cut and wait and see what happens. I asked about this cough that has been keeping me awake nights since the weekend and my oncologist sent me for a quick x-ray to determine if we should go ahead with today's Herceptin or not. He also prescribed some antibiotics and cough suppressants which I had to buy at a pharmacy near the hospital so that cost won't be included in this month's high medical cost refund system. Fortunately these medications were only 1,300 yen. Anyway, I went on up and got my x-ray after a fairly long wait as it was a busy day at the NCC. Then I made my way back down to Dr. F's office and he brought my fresh images up on his high resolution computer screen as well as results from my last x-ray a few months ago. He said that my coughing is from the cold but that it may be worse than just a cold as the cancer in my lungs is taking up important breathing space and that I could start on Taxol right away or next week (if I wasn't feeling up to it because of the cold) instead of in August. Basically, we were waiting for some symptoms to kick in before bringing in the big artillery and this cold qualifies as a symptom in his book. Being well enough to truck on in to the NCC qualifies as being well enough to get treatment so I opted for starting today. I asked about anti-nausea meds over the next few days as this is what I've done in the past but as I'll be getting the Taxol weekly, the doses are smaller and the premedication steroids by I.V. are supposedly all that I'll need. So far, so good, I made it home OK on the train a little before 5 p.m. and actually feel better than I did this morning now that I have some cough medicine and anti-biotics. Now I have to look for a few more bandanas, scarves and summer hats to be ready in two weeks if and when the hair starts falling out. A cool look just in time for the heat of summer. A neighbor reminded me today to cook the pie and not the books to avoid getting Martha Stewart style ankle accessories. Good advice. The recipe for J's birthday fruit tarte tells me to roll the sweet pastry dough to about an eighth of an inch thickness after I've chilled the dough for 20 minutes to make it a little firm and easy to work with. In the 30 seconds from refrigerator to the table, these 20 minutes of refrigeration were negated in the heat and humidity today. I tried, I really did, but I ended up scraping it all back together into a ball and manually pressing it into the pie pan for a more rustic appearance remniscent of my Play-Do years. It is now chilling and letting the the poor mangled gluten rest a little before I line it with aluminum foil and uncooked beans or rice to bake until golden brown. The oven light is not working so I guess I should get the flashlight out of the disaster readiness box so I can peek in from time to time. While the dough was enjoying its first cool rest I went ahead and made the vanilla custard. With six egg yolks this tarte is not for anyone on a low cholesterol diet. My right arm is a little tired from all the whisking but this part of the tarte can qualify as a success. I even made a glaze by diluting, heating and straining some apricot jam. This will need reheating before brushing on the fruit topping at the last stage of assembly. After I bake and cool the shell, I'll coat the bottom with a little couverature chocolate that I've been hiding from the kids (who would want to use it for banana chocolate fondue upon discovery). This should keep the hopefully golden brown pastry from getting soggy after I fill it with the lovely custard. Then the kids get to finish the process by trying to hide all the custard with mango cubes, cherries, sliced kiwi fruit, sliced bananas, blueberries, chunks of canned peaches and whatever other fruit we can find and brushing with the reheated apricot glaze for a brilliant sheen. This is the dangerous part, as too many cooks can jostle the pie and dump it on the kitchen floor. I have an emergency caramel roll sponge cake hidden in the back of the fridge for such contingencies. I've finished the tough parts and have washed all the unnecessary utensils that I will remember to skip using next time and now should probably get started on making dinner as I'll be out teaching tonight. I had my regular heart ultrasound yesterday and it is still big and strong so there is no trouble with continuing Herceptin. It's already time for another ultrasound exam of my heart to make sure the Herceptin isn't doing me in faster than the cancer would have. I haven't had any palpitations (but I haven't seen the new Johnny Depp "Pirates" movie yet) and have been walking and swimming regulary so I expect to come through with flying colors. Speaking of colors, both junior high girls were on the "green" team last Saturday at their school's sports day. They ran fast but were not able to surpass the "red" team this year. There weren't enough girls in their respective classes so both J and M were asked to run twice in the class relay race to even out the numbers. I washed and ironed the long green sashes that the school lent them to use as team headbands. They had Monday off to make up for the school event on Saturday. M will run in a western Tokyo jr. high track and field event this weekend. L and N have school on Saturday as a special parents' observation day and emergency/disaster school pick-up drill. They get next Monday off while J & M head off to school as usual. I hope to pick them up at school on Saturday and rush off to the station with a bag full of onigiri to head out to the track where M will be running as it is her first event and we'd like to be there even if she's going through the "Oh no, I'm so embarassed my little sister and brother are here!" stage. Knowing my luck, we'l get there just after she finishes. At least we can see some of her teammates compete and walk around Minami Osawa on the way home. Next weekend is the junior high Saturday observation day so J & M will be home the Monday after that. That's four Monday's in a row with two kids home. It confuses my sense of time a little and I never seem to know what day it is anymore.